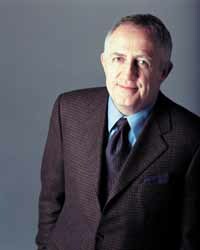 Bramwell Tovey has primarily been known as a conductor, currently the Music Director of the Vancouver Symphony since 2000, formerly Music Director of the Winnipeg Symphony (1989 - 2001) and the Luxembourg Philharmonic (2002 - 2006), as well as guest conducting around the world. However, he has also become known as a composer. His compositions include a Cello Concerto (premiered in Winnipeg in January 2001), written for cellist Paul Marleyn and the Winnipeg Symphony Orchestra for their New Music Festival, a Festival he co-founded with composer Glenn Buhr, and a work for a large choir and brass band, Requiem for a Charred Skull, which in 2003 was awarded a Juno for Classical Composition of the Year (Canada�s Grammy Award). Tovey also composed the film score, recorded by the Vancouver Symphony Orchestra, for Richard Bell's film Eighteen. He was nominated for a Genie Award (Canada's Academy Award), in tandem with Bell, for a song in the film called "In a Heartbeat", which was performed by Thea Gill. On commission from the 2005 British Open Brass Band Championship, Tovey composed 'The Night to Sing' as the test piece, inspired by the celebrations of VE Day, 1945. In 2007, Calgary Opera commissioned a new opera from Tovey, entitled The Inventor, which will be premiered January 29, 2011. From the musical material of this work came his work for solo trumpet and orchestra, Songs of the Paradise Saloon, commissioned by the Toronto Symphony Orchestra for their Principal Trumpet, Andrew McCandless. The New Zealand Symphony Orchestra premiered an orchestral suite taken from the material of The Inventor, on May 6 & 7, 2016, conducted by the composer.